*AdvaCare Joint Support Supplements are GMP certified. **AdvaCare Joint Support Supplements are manufactured in our facilities located in China, India and USA. AdvaCare is a GMP manufacturer of Joint Support supplements. Joint and bone health is a crucial aspect for quality of life and necessary to stay active, especially among aging individuals. Our Joint Support formulas have been designed to provide a full spectrum of nutrients that work together to build cartilage, slow joint degeneration, improve muscle function, reduce pain and strengths bones. Comprised of vitamins and minerals, which restore the healthy functions of bone and joint health, our Joint Support composition also includes Ginger Root Extract and Boswella Serrata Extract to reduce inflammation, pain, and stiffness. Our Joint Support formulas have been scientifically developed with micronutrients to help manage symptoms that can allude to more serious joint, bone and mobility problems. Glucosamine Sulphate: Included as an essential structural component that is naturally present in bones and joints. Glucosamine is a natural compound that helps in the formation of cartilage and synovial fluid that helps keep our joints healthy. Studies found getting extra glucosamine, either through a supplement, could help ease symptoms of arthritis and osteoarthritis. Chondroitin Sulphate: Substance similar to glucosamine and is found naturally in joints, as well. Chondroitin supplementation slows joint degeneration, improves muscle function and eases the pain. Research indicates that chondroitin sulfate can assist the body in its ongoing production and repair process. Ginger Root Extract: Contains anti-inflammatory properties at a cellular level. It helps in relieving pain and stiffness. It contains cyclooxygenase (COX), an enzyme responsible for the formation of important substances called prostanoids, including prostaglandins, prostacyclin, and thromboxane. There are several types including COX-1, 2 and 3. Inhibition of COX can help provide relief from the symptoms of inflammation and pain. Vitamin B12 & Folic Acid: Contribution of vitamin B12 & folic acid leads to low levels of homocysteine which prevents from fractures in old age. Both vitamins play an important role in the remethylation of homocysteine to methionine. Boswella Serrata Extract: Contributes anti-inflammatory effects which are beneficial in benefits in osteoarthritis (OA), and it appears that oral Boswellia supplements can suppress pain and immobility associated with OA quite significantly with the effects taking as little as a week to occur. Vitamin D3: Plays an important role in protecting bones, joints and muscles. Vitamin D is required to absorb calcium in the body. Adults need vitamin D to keep the bones strong and healthy. Supplementation of enough vitamin D is required for maintaining a high bone to bone and calcium to bone density. Glucosamine, Chondroitin, Vitamin A and C, B-vitamins, Vitamin D3. Collagen Type II Complex: Protein that is part of cartilage, bone, and other tissues in animals and humans. Collagen is used to treat joint pain associated with many types of arthritis and surgery, as well as back pain, neck pain, and pain following injury. Copper: Essential trace mineral that has only recently been found to play an important role in bone health maintenance. It –contains an enzyme called lysyl oxidase, which aids in the formation of collagen for bone and connective tissue and contributes to the mechanical strength of bone collagen fibrils — the long thin strands of proteins that cross-link to one another in the spaces around cells. Selenium: Works as an antioxidant in the protection of joints and bones from damage and breakage, enhances immune surveillance and in the modulation of cell multiplication. Selenium supports cellular processes which can lead to normal bone metabolism. Vitamin C: Needed for normal bone development and for the formation of collagen, cartilage, and other structures. Studies have shown a very positive relationship between vitamin C intake and healthy bone density. Rare side effects include: allergy to skin condition may occur due to hypervitaminosis. Seek medical attention if any adverse effects occur. 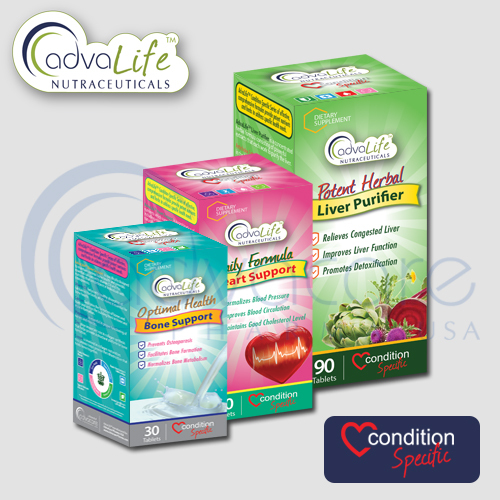 Always consult your doctor or pharmacist before taking AdvaLife Joint support supplements.